We’re getting the hell out of here! We head for France for two weeks tonight. Don’t know when I’ve ever wanted to get away from London as much as I do now. After yesterday’s failed bomb attacks, today police shot a suicide bomber an innocent man at Stockwell Tube station. Bloody hell! Start the car, Alice. Author rrideyPosted on July 22, 2005 Categories ObservationsLeave a comment on We’re getting the hell out of here! Big trouble in London, but we’re all OK. Author rrideyPosted on July 6, 2005 Categories ObservationsLeave a comment on It’s London! David Gilmour, Nick Mason, Roger Waters and Rick Wright on stage together for the first time in 24 years at Live 8 in London last night. Seeing Pink Floyd play (Breath, Money, Wish You Were Here and Comfortably Numb) was the highlight of an amazing day. Sadly, this was the only decent shot I got of them, as after 10 hours of music, the batteries in my camera were all but dead. R.E.M. performing at Live 8 in Hyde Park yesterday. I took a lot of photos (slideshow in the works) but this one is probably one of the best. 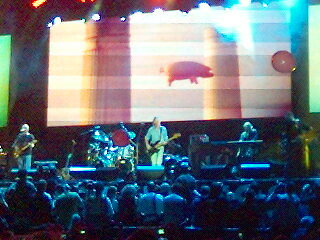 I saw the Floyd live, and they were beyond amazing – as was the entire day. More and better photos tomorrow.